Thomas Culpeper, a friend of the king, and Francis Dereham are executed after confessing, under torture, to affairs with the Queen of England Catherine Howard, the fifth wife of Henry VIII. Catherine will meet a hard end, too — she will be beheaded within months. Francis Dereham was a Tudor courtier whose involvement with Henry VIII’s fifth Queen, Catherine Howard, in her youth, was a principal cause of the Queen’s execution. Thomas Culpeper was a courtier and close friend of Henry VIII, and related to two of his queens, Anne Boleyn and Catherine Howard. He is known to have had many private meetings with Catherine after her marriage, though these may have involved political intrigue. A letter was found written by Queen Catherine and she signed it, “yours as long as life endures.” He blamed the queen, saying he tried to end it, but she was, “dying of love for him”. Under torture, he confessed to adultery, and both were beheaded for treason. (1541) Two men are executed for affairs with Henry VIII’s wife. In colloquial language, Mark Twain’s novel tells the story of its narrator, Huck Finn, and Jim, a runaway slave. The book, which condemns racism, will stir controversy: It’s called “rough, coarse, and inelegant” and “more suited to the slums,” which Twain jokes will spur sales. Inventor of dynamite and manufacturer of weapons, Alfred Nobel didn’t want to be remembered as a “merchant of death,” and so willed that his fortune should fund annual awards to celebrate work that “shall have conferred the greatest benefit on mankind.” Today, on the fifth anniversary of his death, the first prizes are conferred. Otis Redding’s private plane plummets into a lake just short of the runway in Madison, Wisconsin, killing Redding and six other passengers. Just the day before, the soul singer recorded ‘The Dock of the Bay,’ which will become the first posthumous No. 1 hit. Inventor of dynamite and manufacturer of weapons, Alfred Nobel didn't want to be remembered as a "merchant of death," and so willed that his fortune should fund annual awards to celebrate work that "shall have conferred the greatest benefit on mankind." Today, on the fifth anniversary of his death, the first prizes are conferred. 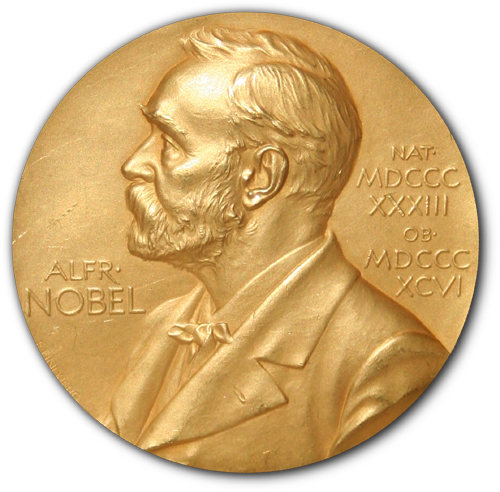 The Nobel Prize is a set of annual international awards bestowed in several categories by Swedish and Norwegian institutions in recognition of academic, cultural or scientific advances. A golden medallion with an embossed image of Alfred Nobel facing left in profile. To the left of the man is the text "ALFR•" then "NOBEL", and on the right, the text (smaller) "NAT•" then "MDCCCXXXIII" above, followed by (smaller) "OB•" then "MDCCCXCVI" below. Two days after launching, the Soviet Union’s space probe ‘Luna 2’ crash-lands on the moon’s surface near Mare Imbrium in the Palus Putredinis region. The spherical spacecraft becomes the first man-made object to reach another celestial body, and the first of many future moon visitors. Luna 2 or Lunik 2 was the second of the Soviet Union’s Luna programme spacecraft launched to the Moon. It was the first spacecraft to reach the surface of the Moon, and the first man-made object to land on another celestial body. On September 13, 1959, it hit the Moon’s surface east of Mare Imbrium near the craters Aristides, Archimedes, and Autolycus. Luna 2 Soviet moon probe. (1959) Spacecraft lands on the moon. Napoleon Bonaparte and his troops enter Moscow as conquerors only to find the huge Russian city virtually abandoned. Almost all have fled ahead of the French forces, and fires begin to break out that will burn almost the entire city, dooming Napoleon to a disastrous retreat from Russia. President William McKinley dies eight days after being shot by an assassin, and Vice President Theodore Roosevelt is sworn in as the 26th president of the United States. At 42, Teddy is the youngest US president, and will go on to be reelected in 1904 in a landslide victory. The first inauguration of Theodore Roosevelt as the 26th President of the United States, took place on Saturday, September 14, 1901 at the Ansley Wilcox House, at 641 Delaware Avenue in Buffalo, New York, following the death of President William McKinley earlier that day. The inauguration marked the commencement of the first term of Theodore Roosevelt as President. John R. Hazel, U.S. District Judge for the Western District of New York, administered the Oath of office.